Every year for Christmas my mum ALWAYS asks me to buy her a calendar so when Snapfish offered me the chance to create a personalised calendar, I jumped at the chance knowing this would be the perfect Christmas present and a lot more personal than your standard shop bought calendars. What I loved about Snapfish was how easy the website was to navigate. Snapfish offer unlimited free photo storage so I uploaded loads of photos to use in the calendar before I got started. They have a wide range of personalised photo gifts and there literally is something for everyone. I went onto the main calendar page on the website here and couldn't believe the available options. 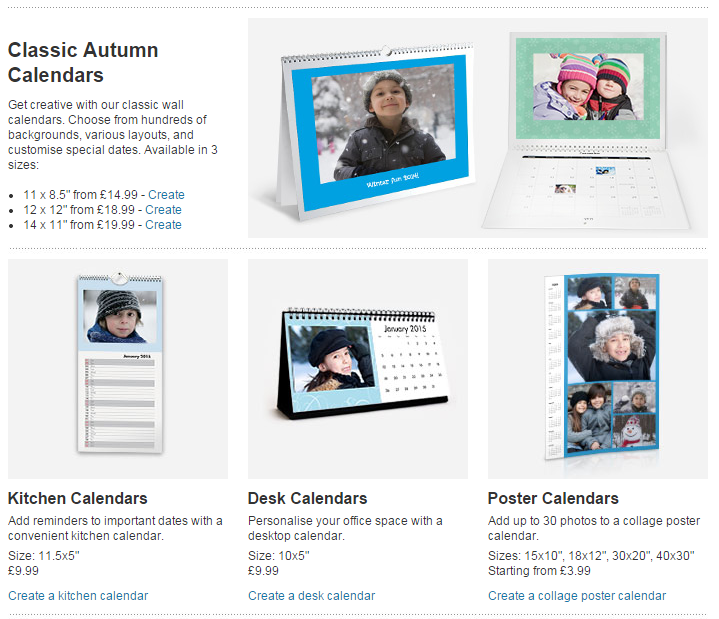 Snapfish have 4 available calendar styles in 9 different sizes. I decided on the slimline kitchen calendar for my mum priced at just £9.99. When I clicked on this option, a range of designs came up which can all be customised. On this occasion I simply chose the basic design and got started with adding photos. The process of creating a calendar couldn't have been simpler. You add your photos to Snapfish and then drag and drop them into the relevant photo areas. There is even an option to auto-fill all photos if you’re in a bit of a rush. You can then edit your photos by cropping them, rotating them and even adding different filters such as black and white. This is a great size for the kitchen and the photos have been printed at a really high quality. Once I added the calendar to my basket and checked it all over for any spelling mistakes I decided to create another calendar. I then designed a calendar for my boyfriend. I decided to go with a slightly larger one and got the 12x12 classic wall calendar at only £18.99. This process was very similar to the last, however this time I decided to customise the calendars with a chalkboard theme. The great thing about the Classic Wall Calendars is that for no extra charge you can personalise certain days, for example on our anniversary, I added a little photo of the two of us. I think this is a really nice touch and a great way of adding a visual reminder of certain events such as birthdays/holidays. I then ordered myself a 30”x20” collage poster calendar for £14.99 which was the easiest to create out of all 3. You simply choose your photos (up to 30) and the website fits these into a lovely collage for you. You can then shuffle the photos around, change them, add a featured photo or leave them as they are. You can then customise the colour, I chose pink to match my bedroom or you can even use your own photo for the background. This size is perfect for the back of my bedroom door. Overall I had a really good experience with Snapfish and will definitely be using them again for personalised photo gifts because the quality and customer service is outstanding. The prices are really good value for money and it means you can give someone a present that is that extra bit special. Delivery was quick however my only gripe is that each calendar came in 3 separate packages which was a bit strange, but I suppose it kept them all separate . *I was provided these calendars free of charge for the purposes of review. All opinions are my own and I was not influenced in any way.